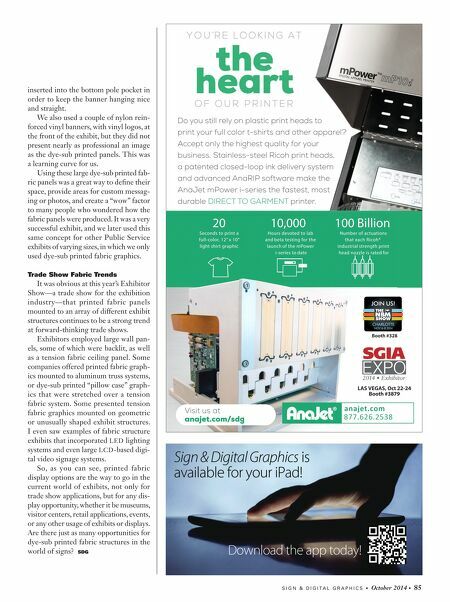 84 • October 2014 • S I G N & D I G I T A L G R A P H I C S ELECTRIC SIGNAGE EXHIBIT & DISPLAY Radius Display Products presented both their dye-sub printing capa- bilities as well as their new Express-Truss system. This 10' x 10' tension fabric exhibit features a curved pillowcase- covered fabric backwall, accented by a front counter with silicone edged stretch fabric graphics. The accent ladder on the backwall uses Velcro applied printed fabric graphics, a 36" wide table top, and hard- ware mounts for a large monitor. (Image courtesy of Orbus Exhibit & Display Group) (Left) GES used fabric structures, more like hanging banners, to pres- ent their logo and messaging, along with video presentations and live entertainment. Laarhoven Portables used a 10'x20' exhibit featuring their pillow- case, dye-sub printed fabric graphics, slipped over their Companion II system. 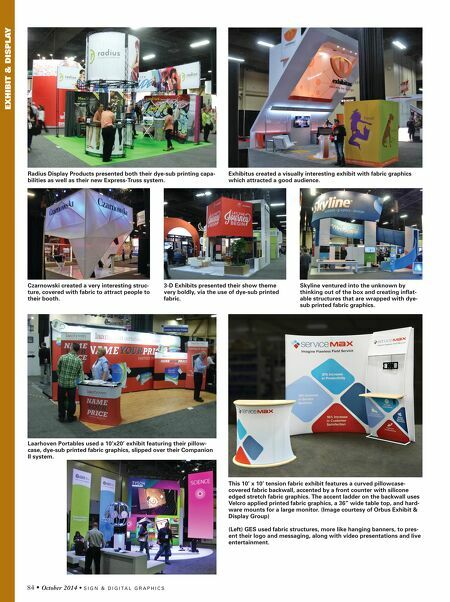 Exhibitus created a visually interesting exhibit with fabric graphics which attracted a good audience. Czarnowski created a very interesting struc- ture, covered with fabric to attract people to their booth. 3-D Exhibits presented their show theme very boldly, via the use of dye-sub printed fabric. Skyline ventured into the unknown by thinking out of the box and creating inflat- able structures that are wrapped with dye- sub printed fabric graphics.